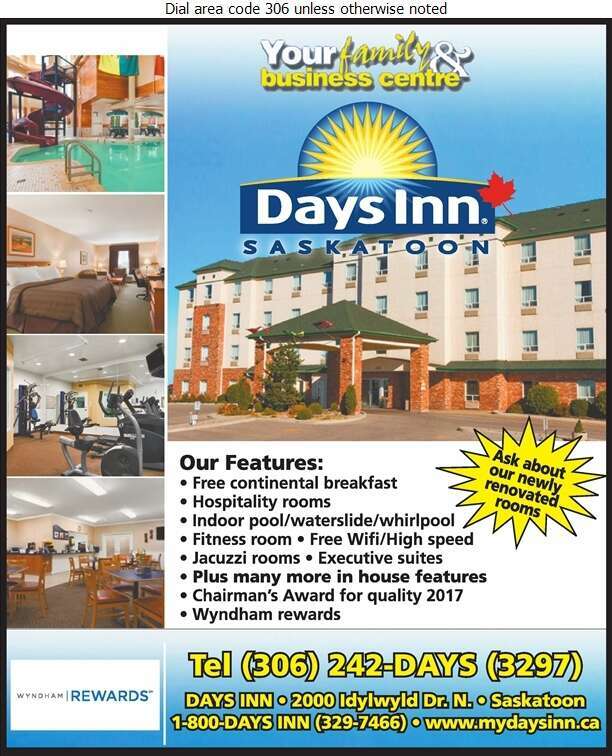 Days Inn - Saskatoon Hotel is conveniently located minutes from the airport, downtown shopping, and the SaskTel Sports and Entertainment Centre. We are the perfect choice for the family or business traveller. Our modern guest rooms have a pillow top mattress and duvet, free WIFI/high speed internet, mini fridge, coffee maker, iron & board and a 32" flat screen TV. Take advantage of our courtesy airport shuttle, free Day Break Cafe breakfast, indoor pool with waterslide and hot tub, business centre, meeting facilities. Our room types include classic 2 queen beds, business class, Jacuzzi suites, the Honeymoon and family suites. Ask us about our newly renovated rooms. Call us and our welcoming and knowledgeable staff will strive to meet all your travel needs.